What’s to be Done with the Current Stock Market? HomeBusinessWhat’s to be Done with the Current Stock Market? 55% believe the market is fair only to some investors. Over the last two-and-a-half years, investors have pulled a net $244 billion out of stock mutual funds, adds the Investment Company Institute. Meanwhile, they’ve poured $589 billion into bond funds during the same period. Yep, you could have parked your money in 90-day Treasuries and rolled them over continuously…and you’d have made nearly as much money as you’d have lost buying an S&P 500 index fund. 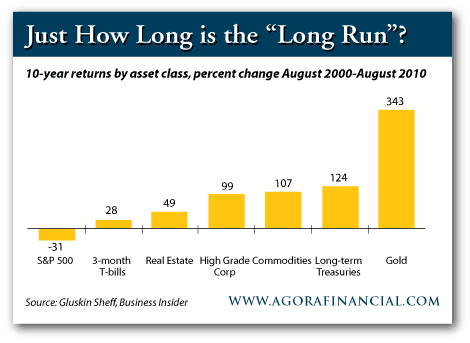 One single investment decision in 1999 – to put your money in gold – would have paid 10 times that return. Of course, gold was the province of cranks and kooks back then…so very few people made that choice. But they sold $411 million – a ratio of $291 of stock sold for every $1 purchased. But hey, it’s an improvement over the week before, when the ratio was 652-1. “Odds are if your neighbor knows anything at all about the stock he just bought beyond its ticker symbol,” says Mayer’s Special Situations’ Chris Mayer, “it is probably the price-to-earnings (P/E) ratio. “The P/E ratio is the most well-known (but not best) measure of how cheap or dear a stock may be. The market overall, too, has a P/E that rises or falls dramatically. It has fallen 35% in the last 12 months. Earnings surged in the second quarter, but the stock market was lower. Chris recently reread Humble on Wall Street, the 1975 memoir of investor Martin Sosnoff. Like many in those era, Sosnoff got burned by the bear market that set in after the Dow hit 1,000 in 1966. “It is worth saying,” Sosnoff wrote, “how difficult it was for any professional investor in 1965 to conceive of the Dow Jones industrial average heading toward 7 times [earnings] when it was then at 17 times. A handful of people did, like A.T. Mahan, who toiled in a now-defunct brokerage called Delafield and Delafield. He saw prices advancing more slowly than profits – and the inevitable compression of P/Es that would follow. “We are currently in an early phase of an ebb tide,” he wrote in late 1965. In other words, “It’s a good time for stock pickers,” says Chris. A basket of carefully chosen stocks is about your only choice right now if you don’t want to flee to strictly gold and/or cash.